Home » ladybusiness anthropology » Repost: Which is more safe: home birth or hospital birth? Repost: Which is more safe: home birth or hospital birth? I am slowly re-posting some work from my lab blog. This one received quite a bit of traffic. I actually have a follow-up in the works, so watch for it! You have probably seen the buzz about the recent American Journal of Obstetrics and Gynecology article (Wax et al 2010) on home birth safety, and the editorial in the Lancet that took the article’s shaky meta-analysis to crazytown: “Women have the right to choose how and where to give birth, but they do not have the right to put their baby at risk,” they write. I have a lot of thoughts about this study and how it has been covered, by medical doctors and by the media. My main issues revolve around: 1) what these statistics mean from a personal versus a public health perspective, 2) maternal recovery and mortality, 3) the problem with criminalizing home birth, 4) the literature around birth experiences and the process of birth and resources for women, and 5) how we should look at this topic in the future. According to the Wax et al (2010) meta-analysis, the difference in infant mortality between hospital births and home births is 0.2% versus 0.9% (other people have already done a nice take-down of the cherry-picking of older studies that have received significant criticism, yet were included). While headlines have screamed that this is a three-fold difference, it makes sense for us to pay attention to the absolute values. Infant mortality, in hospital or home births, is under one percent. We can’t even say that one in one hundred babies die in childbirth in developed countries any more (at least not as a whole – for now I’ll side-step some major differences relating to social disparities and race). If you are pregnant and considering where you want to give birth, I’m not sure how this slight difference could really sway you one way or the other. The problem is that the editors of the Lancet (and others) are conflating public health recommendations with personal recommendations… and shaming women in the process. From a public health perspective, I suppose I can grudgingly understand why the difference in infant mortality in home versus hospital births matters. But you cannot take population-wide statistics and apply them to individuals. To do so is to ignore inter and intrapopulational variation, and to take a women’s decision about her body out of the context in which it should be understood. Another thing to notice, Wax et al (2010) found that “neonatal outcomes of planned home births revealed less frequent prematurity, low birthweight, and assisted newborn ventilation.” So of the more than 99% of babies who were fine, home birth babies tended to be healthier. This of course could be a bias of who chooses a planned home birth versus someone who does not, so I am not assuming the directionality to be that the home birth predicts healthier kids. But I wouldn’t be surprised if further analysis showed both directions to be causal; that is, that women more likely to have healthier kids choose to plan a home birth, but also that because home births have fewer interventions those kids are more likely to be healthy. What the Lancet editorial and Wax et al (2010) mention only briefly, is that for maternal mortality and morbidity in low-risk births, to me, home births (and, I would contend, birth center births) are the clear winner. By not being in the same room as epidural medicine (it’s right behind you in big cabinets, just waiting for you to say “ow”*), single beds with little room to maneuver, continuous fetal monitoring and an IV under your skin as soon as you’re admitted, you avoid interventions that often carry their own significant risks and precipitate a cascade of other interventions. Many women in the US don’t want to give birth in hospitals because being in a hospital increases the risk of maternal mortality and morbidity and, perhaps more importantly, slows recovery time. I say the recovery time issue may be more important, because while the US is embarrassingly bad at keeping mothers alive, the numbers are still better than in infant mortality (though, obviously, this makes sense from a life history perspective). The US is ranked 40th in the world in terms of maternal mortality – that means 39 countries do a better job keeping women alive during childbirth. Our incidence of maternal mortality is increasing, not decreasing, with the latest figures for 2008 being 17 deaths out of 100,000 births (Canada, for instance, has 7/100,000). Developed countries with higher rates of home birth have lower rates of maternal mortality. Another problem I have is that part of the reason they cite home births as unsafe is that so few of them are staffed by certified midwives (only one third according to the Lancet editorial). The only reason more home births are not staffed by certified midwives is that organizations like the American Medical Association and others have lobbied to keep home births illegal in many states. Midwives cannot legally help a family give birth at home where I now live, in Illinois. Instead, I have been told by local homebirth supporters that there is an underground movement of lay midwives who try to help women stay out of hospitals, if it’s what they want. Is this a safe way to give birth if you are low-risk? Maybe, maybe not. I’m not sure I would be keen on a home birth that did not have a Certified Professional Midwife or Certified Nurse Midwife attending, who also had a good relationship to a doctor at the nearest hospital. But I also would not want to give low-risk birth in a hospital, even if I had a midwife, because of the major risks you incur just by stepping into a hospital (like infection). Women in states like mine are stuck between a rock and a hard place: give birth at home and risk not having someone with the right qualifications (and potentially face legal action), or risk giving birth under conditions where you may have interventions you don’t want, and treated like something less than human (which I’ll get to more in the next section). By criminalizing home birth, medical doctors and their lobbyists force women who don’t want a medical birth to find less-than-perfect alternatives. So when Lancet editors and others criticize US women for not having the right people at their home births, I call shenanigans: they were complicit in making the laws that prohibit it in the first place. There is a huge literature already on the medicalization and pathologization of femaleness, and I encourage you to devour it all, from Emily Martin’s The Woman in the Body to Robbie Davis-Floyd’s Birth as an American Rite of Passage. So the other issue I want to make sure to include here is that pregnant patients don’t have the same rights as non-pregnant patients in a hospital (link to pdf), to refuse treatment, to leave, to contest a decision; hospitals can and do get court orders to force pregnant women to receive treatments they have refused. On the one hand, I can understand that sometimes decisions need to be made quickly during labor. On the other hand, I think there is a problem when we place a fetus’s rights above that of its mother’s. This recent story of police violence against a pregnant woman links to several problems with pregnant patient rights. Here are examples of court-ordered interventions. And here is more information on pregnant patient rights. These are other reasons many women find the idea of a hospital birth frightening, and thus choose home birth or a birthing center. And if you read Davis-Floyd and others, you will see the interviews of women who have had hospital births how they were disempowered by the experience. This isn’t to say there aren’t many, many women who aren’t totally satisfied with hospital births, and would never consider home birth. It’s just to say that to acknowledge differences in infant mortality risk that are not necessarily meaningful to an individual making a decision about this, in the absence of all this other information, is disingenuous on the part of the editorial writers at the Lancet. 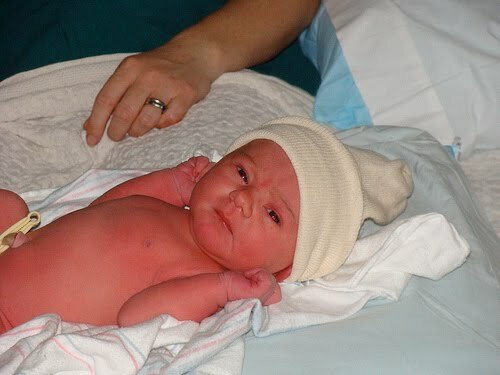 My daughter, just born at the birth center. Rather than blaming the women who are trying to make the best decisions for themselves and their families and fetuses, medical doctors should be doing more to make different kinds of birth options available for women. In 2008, I gave birth in a birth center that was across the street from a hospital – the Cambridge Birth Center in Cambridge, MA. I had midwives, doulas, a labor and delivery nurse, my husband and sister to help me. I had a nice big king-size bed, a big tub to labor in, and just about every device you can think of to help me labor and push out the baby, from floating noodles for the tub, to a yoga ball, to a birthing stool. The time to get from the birth center to operating room if there was a complication was 4 minutes – the same amount of time had I been in the delivery room at the same hospital. This option is not available to me now, as a resident of the state of Illinois. I’d like to see is re-analysis of the literature, where only home births with a certified midwife are analyzed. This is what is possible if we allow women more choices in where they give birth, so this is what we should examine. When we decriminalize women who don’t want the higher risk of epidurals or cesareans or infections, when we provide women more options for how and when to labor and give birth to their babies, and when we are honest with the failings of the medical system towards pregnant women and women in general, we’ll be heading in the right direction. *What bothers me about epidurals and narcotics is not that women choose to use them during birth. I have given birth, I know how much it hurts and how it feels like the pain will never, ever end. I would never, ever begrudge a woman for choosing pain relief under those circumstances. What bothers me is that it is presented almost as a given in most hospital settings these days, since the medicine is already in the mother’s hospital room. There are many interventions one can give for pain that are not pharmaceutical, but few doctors are trained in these interventions. My midwives and doulas had so many tricks up their sleeves that even though I was in excruciating pain, I was able to remain in the birth center and have a totally normal, natural childbirth. I also want to be clear that if I hadn’t clearly stated I wanted this in my birth plan, they would not have worked so hard to make this possible. I wanted to be kept out of the hospital, kept away from the risk of infection and the risk of narcotics and the risk of cesareans and episiotomies, so they helped facilitate that within what was safe for me and my baby. By kateclancy in ladybusiness anthropology, research blogging on September 16, 2010 . Many of these studies use all out-of-hospital births including unplanned home and emergency side-of-the-road type births in the statistics skewing the outcomes. In states such as Illinois and Alabama (where I did my PhD) there are often working midwives who were licensed in other states but can't get lic. in their current states due to the laws meaning they are working illegally and without hospital/doctor back-up for emergencies. Erica, this is a great resource and I agree with your assessment of these studies. It's infuriating how no news outlets, or the condescending Lancet editorial board, picked up how biased the study was. I really appreciated your comment about only comparing certified midwife attended births so as to be comparing similar things. Would it also be appropriate to factor distance from a hospital into the risk breakdown for women wanting to make a choice about home birth?